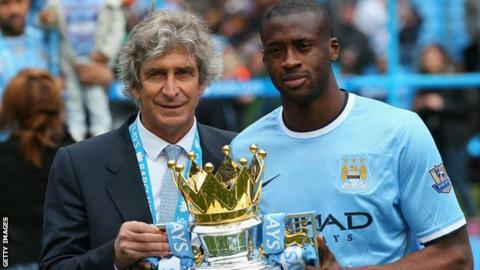 Manchester City boss Manuel Pellegrini has "no doubts" that Yaya Toure remains committed to the club. And Pellegrini believes his side can cope without the midfielder, 31, while he is away on Africa Cup of Nations duty with Ivory Coast. "I don't think our team depends just on one player," said Pellegrini. Asked about Toure's future, the Chilean added: "I think Yaya is 100 per cent committed with our team. I don't have any doubts about that." Speaking in an interview while on international duty earlier on Friday, Toure was asked about his long-term future. "I don't know. I'm at City at the moment," he told CNN, before laughing. Speculation surrounded Toure's future last summer after his agent claimed Manchester City's owners showed him a lack of respect on his 31st birthday. "I don't think any of us know what will happen in six months," Pellegrini added. "But it's not a problem with his commitment. You can't link one thing with the other. I repeat, Yaya is very happy here. His commitment with our club is not a problem." The former Barcelona man could be absent for four weeks due to his involvement in the tournament. He will definitely miss the trip to Arsenal on Sunday and the 31 January visit to current league leaders Chelsea. City have not won in the league without Toure since last April - he was rested when City were held by Burnley on 28 December and September's draw with the Gunners. However, Pellegrini believes City can still prosper in his absence. "Of course we are going to miss Yaya because he is a very important player," he said. "But we have a squad and we have to replace Yaya. We must continue fighting for the title with or without Yaya."